Pour into pan and bake for 25-30 minutes until a toothpick inserted in the center comes out clean. Cool completely. Beat cream cheese, powdered sugar & vanilla and add just enough milk, a little bit at a time, to get a good spreading consistency. 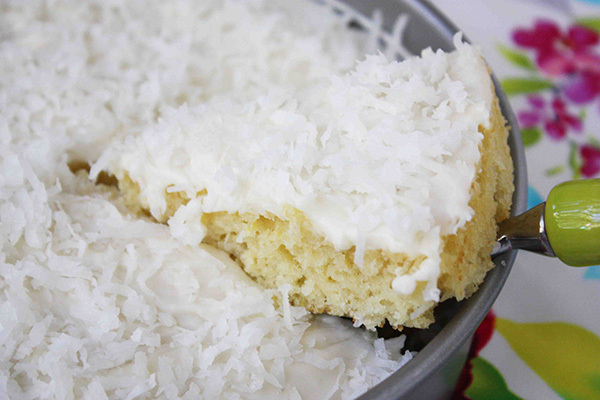 Frost the cooled cake and top with more shredded coconut. Keep refrigerated. 24 Comments on "Easy One Bowl Coconut Cake"
Saw comment about dryness. I used VERY moist Baker’s angel shredded coconut & Trader Joe’s Coconut Creamer instead of milk & followed directions faithfully. Rewarded with EXCELLENT moist cake. I also like the small recipe portions. Did not work for me the cake is dense…. Mine didn’t turn out so well either…dense and not sweet enough like coconut cake should be. So I came back and read through the comments….and then I realized that I used dehydrated UN-sweetened shedded coconut. I bought it awhile back for healthy organic smoothies to combat some autoimmune issues. Well…long story short I’m wondering if maybe you also used unsweetened…which would be drier that the sweetened coconut that is most popular in the grocery stores. Well, I’m going to give it another go, I should have paid better attention. Jenny if you happen to read this please know I think your recipes and videos are wonderful. Love you to pieces…you’re AWESOME (I know this because I’ve read your bio and articles about your philanthropy❤️) God bless you Jenny!! I just made this for my husband’s BD. I haven’t tasted yet, but it sure rose in the pan, and all my ingredients were at room temp. I even used a black pan. It sure looks good though after I iced it. Love these small cakes as there’s not tons of leftovers to temp you for days on end. Thanks for a great recipe! Jenny, I have never baked a cake. which brand baking pan do you use to make 9 inch round cake ? Lighter color metal pans bake more evenly than dark. You have to be careful with dark pans as they bake more quickly and can burn. Oven temperature can be lowered by 25 degrees with dark pans. Check for doneness early. Wilton, Williams Sonoma, Chicago Metallic or any other inexpensive pan work fine. Lighter color aluminum pans with a dull finish work well for baking as they absorb and conduct heat evenly. Glass pans conduct heat poorly but conduct heat evenly. they are great to store citrus or fruit based cakes in due to pitting that can happen if leaving in the pan while storing it. DON’T broil in glass. Pyrex has some restrictions for using cold in a hot oven, so research the brand you have if using glass. Most Corning Ware can be used hot and cold in the oven, no broiling and the same goes with the lids as they are Pyrex…No oven use until they are room temperature. Again check restrictions. They will be specific as to use: oven, stovetop, broiler, etc. Silicone pans are available but are inconsistent and concern is leaching of chemicals with some brands when exposed to heat, great for cold and candy making. They are somewhat different than silicone baking mats and utensils. Silicone spatulas, bench and dough scrapers are fantastic. These are more safe with baking cookies such as Silpats and reputable brands. Line all pans with parchment for easy removal, if baking a cake. I understand that baking strips are available for .wrapping a pan prior to baling your cake for even, consistent baking but I’ve never used them. Some of mine are as old as I am or older and still work great. They were my mother’s and grandmother’s! Mine does not have a name but I recommend a light colored metal pan, not dark and not glass. Coconut cake is my favorite! This looks like a must-try recipe. Fabulous! Wonderful! Delicious! Baked this for my mother’s 94th birthday. Coconut cake is her favorite and this recipe is tops in both of our estimations. Was out of vanilla flavoring yet still a hit! Thanks for helping my mom have a great day. I love your no-fuss recipes, I also LOVE coconut in any shape or form. My question is: Can I use coconut oil in the same amount shown in the recipe? Try this website for converting coconut oil for other oils. May have different outcome in this recipe, though. Using coconut milk, canned or refrigerated(in the dairy isle with milk) may work well if you felt the need to change the original recipe. I haven’t made this yet but I’m sure the recipe as written is delicious as ALL of Jenny’s recipes are! Thank you – this is good to know. Thank you ChrisH. I looked up different websites (one is LIVESTRONG) and they all, say the same. Coconut oil must be obviously in a liquid form and can be used in the same amount of other veg. oils, however it cannot be mixed with cold foods or will solidify again, at least a little. So I will use my beloved coconut oil for this recipe. I just love your videos, especially the no knead bread! Remember you on your talk show, always watched it. When I saw you again it took me time to place where I knew you from, your still so cute..
PS If anyone comes on Jenny’s site just for the recipes, be sure and watch the videos. Not only are they helpful they are so cute and entertaining! You will love them and Jenny “in person”. I just ran to my coconut and it is not sugared, because of Mariana post. I personally will add some more sugar, because I use stevia, and my family likes healthy sweet. As for the coconut topping that is not an issue because they snack on it raw, Tomororw after work, I will make one. Thank you Jenny! I’ve been interested in collecting easy, one bowl recipes for cake that I can make without a lot of fuss and with ingredients I typically keep in my pantry. This one fits the bill. I’ve lost 39 pounds so far this year and would like to lose another 39. The thing is that I don’t believe diets work for me. For the weight comes off quickly and returns once “normal” eating resumes. I find it easier to keep a food journal to insure that I’m eating conciously. Nothing is off limits, but I watch my portions and make it a rule to avoid prepared foods. If I want to eat coconut cake, then I must labor to make it. Thank you Jenny, I’m happy to eat cake! Dehydrated coconut will likely be drier than the one I use so you will have to experiment – the amount of sugar may not be the only concern – the cake could also be a little dry.